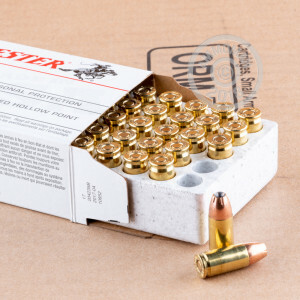 Winchester USA "white box" ammunition is a great cost-effective choice for the range, and also a great option for CCW use. These affordable 9mm Luger cartridges fire a light 115 grain jacketed hollow point bullet at 1,225 feet per second and deliver good accuracy and expansion potential. 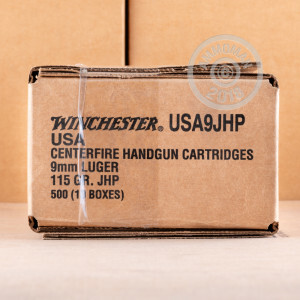 This ammo comes in boxes of 50 and uses non-corrosive Boxer primers and brass cases. Like other Winchester ammo, these rounds are loaded in Oxford, Mississippi. 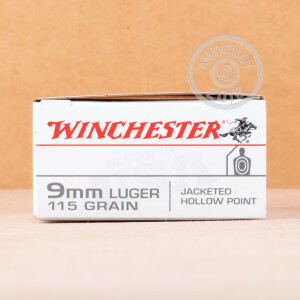 Winchester has been operating here in the US since 1866. This USA 9mm Luger is light on the wallet, but heavy on the punch. Order yours today and see for yourself.